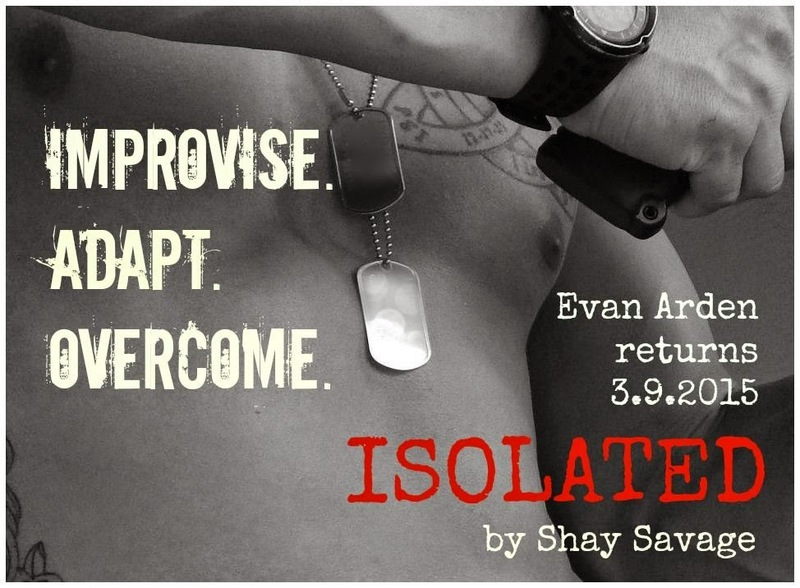 Shay Savage: Evan Arden is Back! ISOLATED is coming March 9th! Improvise, Adapt, and Overcome. The mantra is good enough for the Marines; it’s good enough for me. Improvise . . . Near the top of the world, I fight for my life against my opponent, Sebastian Stark. He has the upper hand in strength, but I have the cunning to turn the tables on him. I battle the elements, my demons, and him until Stark and I manage to strike a deal to ensure freedom for us both—and the women we love. Adapt . . . Being alone comes naturally to me. I’ve spent most of my life alone. Sharing my experiences, opening up to another human being, developing a relationship—all these things are foreign to me. Sometimes I wonder if it’s even meant to be. Overcome . . . I’ve been away from Lia for far too long, yet I still have commitments I must keep. When I make my way home, I will tell her I have decided to end the life I have led and move on to become the man she needs. I can overcome my demons; I must. But will Lia be willing to wait?